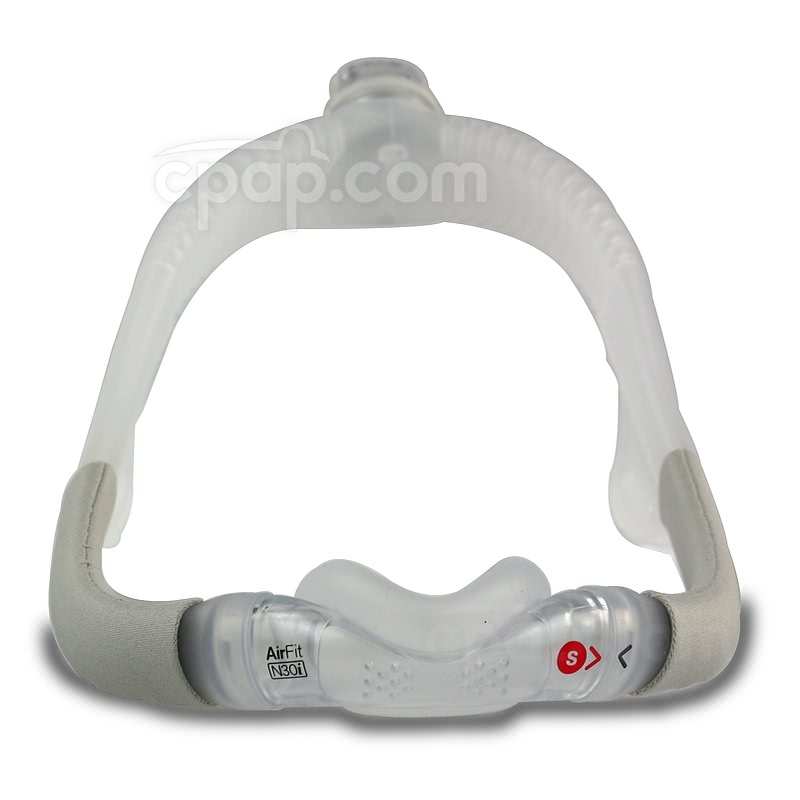 The AirFit™ N30i Nasal Mask Assembly Kit is a combination of frame, cushion, and elbow for the N30i CPAP mask. The assembly kit does not include headgear, which must be purchased separately. Looking for the N30i Start Pack which includes the headgear and several cushion sizes? 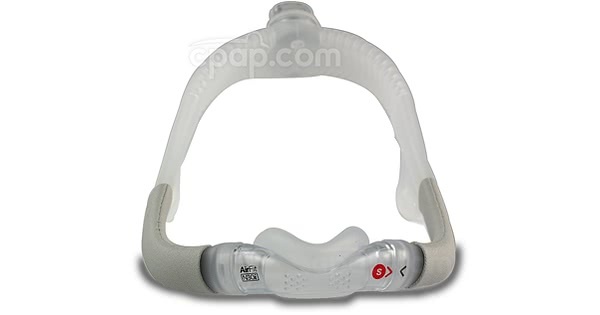 You can view and purchase that configuration here: AirFit™ N30i Nasal CPAP Mask Starter Pack. The AirFit N30i features a low-profile nasal cushion with one of the most open views of any mask in the category. Catch a favorite television program, read a book, or surf the web before bed-- all while wearing the mask! Attention active sleepers! The AirFit N30i is flexible enough to move with you, as you search for the most comfortable position during sleep. The crown-of-head hose connection allows for 360 degrees of motion, and the frame is flexible enough to stretch and shift in the night. Minimalist Hollow-Frame Design - Only 3 Parts! Finally a mask for active sleepers able to move as you do! The elbow connects to the mask on a crown-of-head hose connection allowing for a full 360-Degree range of motion-- great for active sleepers! The ResMed AirFit N30i also allows you to comfortably adapt to most sleeping positions, making it an ideal choice for anyone who may find getting comfortable with CPAP difficult. This mask checks in at only 24 decibels, which is quieter than almost every CPAP machine, as well as many other masks. If noise from therapy is a source of irritation, this mask is a great choice. Tired of the bulk found near the nose of most nasal masks? Is it hard to enjoy bedtime activities? The curved nasal cushion cradle is extremely low-profile and creates a good seal, while reducing most of the bulk found in other masks. This allows anyone to sleep almost any way they'd like, as well as enjoy almost any visual bedtime activity. Command a view practically unrivaled by other CPAP masks with the AirFit N30i. Enjoy usual bedtime activities like reading, watching TV, or using electronics-- all while wearing the mask. For those who require a longer time to settle down and fall asleep, the AirFit N30i is a great choice. The minimalist hollow-frame design is featherlight and very flexible. Made of silicone, it's able to stretch and move with you as you shift throughout the night. Air passes from the hose to the elbow, and then flows to the nose through the hollow frame, eliminating the need for an extra tube. The frame also comes with soft wraps to make the silicone frame more comfortable. Shifting in your sleep can close off one side of the frame, and if this happens, the air is automatically redirected to the other side, maintaining airflow so there's no chance of suffocation. The cushion uses a comfortable curved silicone pad, positioned under the nose. The silicone pad connects to the frame using a hollow, firm plastic shell. The silicone pad and the shell are attached, and cannot be separated. To install the cushion as part of the frame, slide the plastic shell of the cushion into the frame. Each cushion size is color-coded and has an arrow stamped on the front of the cushion. There is also an arrow on the frame. The two should line up when connected correctly. Per the manufacturer, men are encouraged to go with the regular frame size, and women are encouraged to go with the small frame size. If either size feels tight or loose, consider sizing up as the case may be. The soft wraps don't detach from the frame easily, so it may be better to just wash the frame and soft wraps together. Submerge the entire frame in mild soapy water. As the frame is hollow, cleaning the inside of the frame is necessary. After soaking in the mild soapy water, allow to air dry. Use mask wipes or mild soap and water to clean the cushion. Make sure to scrub gently to remove any debris or deposits from the cushion. Allow to completely air dry before next use. Clean the cushion and elbow every day. Clean the mask frame once a week. Can Someone Who Breathes Through the Mouth Use This Mask? A person breathing through the mouth could use this mask, provided he or she was comfortable using a chin strap. The chin strap keeps the mouth shut during sleep, forcing the person to breathe through the nose instead. Is the ResMed AirFit N30i a Quiet Mask? The ResMed AirFit N30i is one of the quietest CPAP masks on the market today, with a total sound output of 24 decibels, considered whisper-quiet. Is a "For Her" Model Available? ResMed currently does not have a "For Her" model of this mask available.